Welcome to the home of the Lambda Lambda Chapter of Kappa Kappa Psi! Kappa Kappa Psi, National Honorary Fraternity for College Bandmembers, was founded at Oklahoma State University on November 27, 1919, by ten outstanding band leaders. The Lambda Lambda Chapter was established on the campus of Indiana State University on February 27, 2005 by fifteen distinguished men and women. 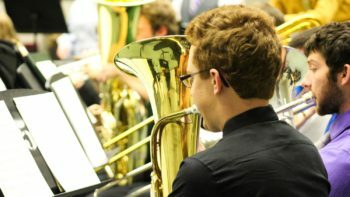 The Lambda Lambda Chapter actively serves the university bands, recognizes outstanding musicians through membership, develops and stimulates campus leadership, and creates a strong bond of brotherhood between the brothers of our chapter and the more than 66,000 lifetime members of the Fraternity. 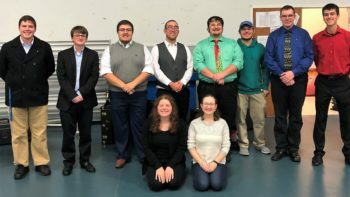 We, the brothers of Kappa Kappa Psi, believe that service to the college or university band program fosters responsibility, loyalty, and leadership; that a spirit of brotherhood is enhanced by the participation in a band program; that music is a universal language and truly the greatest of the arts; and that through fraternal participation, each member will strive for the highest.